With the number of different immigration policy changes that have been proposed and passed recently, it’s understandable that concerns about deportation are higher than ever. For those out there who have a green card or a visa, that’s an excellent start. But did you know you can get deported, even with those documents? As the saying goes, to be forewarned is to be forearmed. Here are the most common reasons for deportation, to help you prevent deportation for yourself or a loved one. Of course, if you have concerns about deportation or other immigration questions, we suggest meeting with an immigration lawyer, such as the team at the Law Offices of Diron Rutty for further assistance. When a green card or visa is issued, it comes with both a time limit and a set of limitations. Violating any of those conditions makes the holder eligible for deportation. For example, those who come to the U.S. on a tourist visa are not allowed to work. Before taking a job, that individual would need to acquire a different visa. However, ensuring the visa or green card is renewed on time matters just as much. An out of date visa or expired green card means that individual is eligible for deportation. Committing a crime — and being convicted by a U.S. court — often leads to deportation. It is important to note that not all crimes will make one eligible for deportation. Any crime that is considered an “aggravated felony” or a crime of “moral turpitude” makes that person deportable. This includes a long list of crimes you may expect, like drug trafficking or money laundering. However, immigration authorities will classify a crime differently than the courts for immigration law purposes. This reason is related to the previous reason, but it is different enough that it warrants mentioning. Violating an immigration law makes one eligible for deportation. This includes things like marriage fraud for the purposes of immigration or trying to smuggle others into the U.S.
A part of the green card application process is proving that an applicant will not need to rely on the U.S. government for support — called being a “public charge.” If a green card holder accepts any sort of public assistance, they become a “public charge” and are breaking the terms of their green card, so they become eligible for deportation. It seems like such a small thing, but failing to contact U.S. Citizenship and Immigration Services about a change of address in a timely manner makes an individual deportable. Immigrants have ten days to submit the online form after moving. If you face deportation or otherwise have questions about immigration, meet with an immigration lawyer. 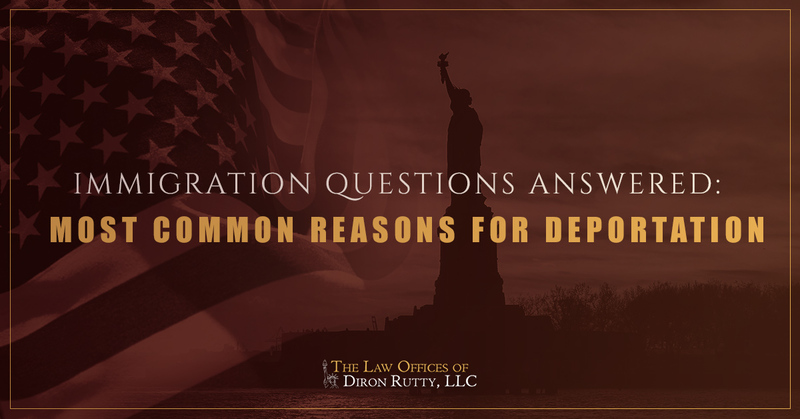 At the Law Offices of Diron Rutty in the Bronx, we can provide advice about your immigration situation, help with green card or visa applications, and provide legal counsel. Give us a call today to schedule a consultation.